More Titan action coming at you in Episode 85! First of all, we continue our series about playing Adeptus Titanicus, while in Painting Black ... and Other Colours, we take a look at Legio Mortis. We then welcome back Andrew for the final part of his stellar Science of Astartes segment, before we complete our discussion of Titanicus by Dan Abnett. In this episode, we continue several discussions: first, Mark takes us through optional rules that should not be optional in Adepticus Titanicus; Myles continues our reflections on developing a new Titan Legio with some colour schemes for Legio Solaris; we welcome Andrew back on the show for more analysis about the science of Space Marines; finally we continue our discussion of the masterful Titanicus by Dan Abnett. But before all that our roving reporter Darren takes us through the news from the Vigilus Weekender. It's a packed one, we hope you enjoy it! The Siege of Volganis has been broken and the Warmaster's armies are on the march! Now, with Helios Prime itself under threat, the blasted-our agri-world of Helopherion has lost all its importance. 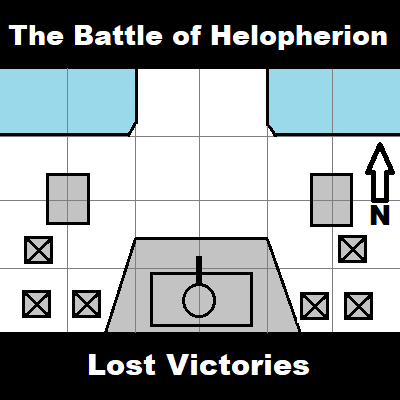 The Merchant Households have decided to cut their losses and withdraw, but the Warmaster's forces, newly bolstered by the Word Bearers Legion, will not make it easy for them. In Episode 8 of our Battlecast campaign, Helena Gauntë's XIIIth Household faces off against a combined IVth and XVIIth Legion force, supplemented by Volgan Cossacks, in an attempt to cover the evacuation. It is the Third Battle of the Thadrik, and accounts will be settled! After a longer than expected hiatus we are back! In this episode, we welcome Grieux to tell us how we were wrong about FW's new pricing, while Mark starts a new series about how to play Adeptus Titanicus. In Painting Black ... and Other Colours, Myles discusses conceptualizing a unique Titan Legio, before we discuss the science behind creating a Space Marine with Andrew Gray. Finally, in Tales of Heresy, we analyse the brilliant Binary Succession by David Annandale. Legio Solaris walks! It's finally time! Our second annual Alternate Heresy Spectacular! In this episode we welcome Kenny from the Combat Phase Podcast to help us with the quasi-impossible task of choosing the best Alternate Heresy from an almost rediculously strong field! But before that, our roving reporter Darren comes on to tell us all about last month's Open Day! Strap in because this one is epic! In Episode 79 of the show we interview Jack, the mighty Anvils of Konor, to get some pro tips for converting miniatures. We then go into the fourth and final installment of our coverage of The Crimson King by Graham McNeill. Episode 78! In this one JP and Myles do their best to break down the recent FAQ while rules guru Mark is on vacation. Then, in Painting Black ... and Other Colours, Myles discusses keeping your paint wet, especially in the summer heat. We then go into Tales of Heresy with the third part of our coverage of The Crimson King by Graham McNeill. Also don't forget to send us your Alternate Heresies, contest closes 28 July! In this latest installment in the "can't get an episode out on time" chronicles, we welcome our roving reporter Darren to take us through the awesomeness that was Warhammer Fest and all its Adeptus Titanicus goodness! We then jump into one of our favourite segments: Ask Myles Anything!, where we invite our dear listeners to ... well ... it was in the title. We then jump into Tales of Heresy to begin a series on the Crimson King by Graham McNeill! 2.02.18 Painting Black ... and Other Colours: Ask Myles Anything! The grinding siege of Sebastok is in its second month, and slowly but relentlessly, the Warmaster's forces are being pushed back into their last stronghold, the Administratum District. 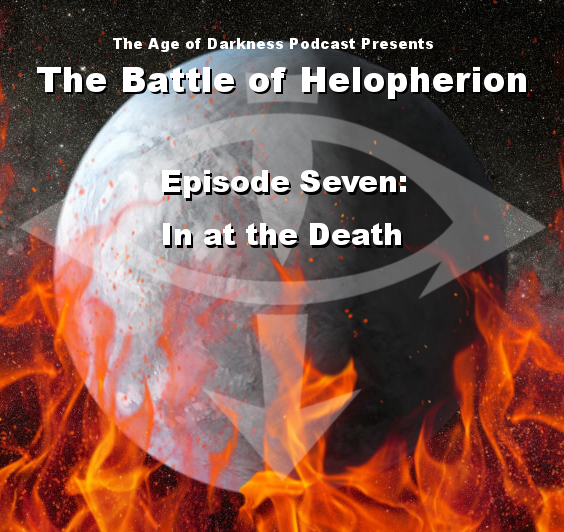 In this seventh episode of the Battle of Helopherion, Helena Gauntë's XIIIth Merchant Household launches a massive offensive against Krios Dracontites' Iron Warriors and their Volgan Cossack allies. Is this the end for the glorious defenders of Helopherion? Tune in to find out. After a few episodes analyzing the amazing novel Fear to Tread by James Swallow, we now turn the microphone over to our listeners! In this latest call-in show, we continue our discussion of the Blood Angels' entry into the series, and, why not, a bit of 8th ed! 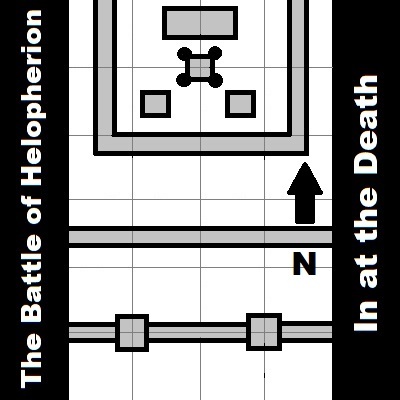 In this very weird one we combine the episode we recorded before Adepticon but didn't have time to release with some extra content that through the magic of editing will break the laws of space and time. After discussing our (fuzzy) memories of the greatest weekend of the year, we turn to a long-overdue Fluff Flashback segment about the recently re-released Slaves to Darkness, hail the Great Head of Chaos. We then turn to Painting Black ... and Other Colours, where Myles and Mark take us through planning and building a Destroyer Host, before concluding our coverage of Fear to Tread by James Swallow. In this episode of the Age of Darkness, we risk unpopularity as Mark offers a spirited defence of the 8th Edition ruleset. In Painting Black ... and Other Colours, Myles takes us through the process of designing a new army project that balances the holy triad of lore, list, and hobby. We then turn to Tales of Heresy to give our resident Sanguinius superfan a chance to talk about his boy by analysing Fear to Tread by James Swallow. We then close out with an extended Vox-Box and of course the Two Week Hobby Challenge. And we are back! We hope you will forgive us an unforgivable delay in getting this episode out, but we are not dead and are stoked to chat some Angels of Caliban! In this episode, we invite our listeners to let us know how we are wrong about everything!